Born Malcolm John “Mac” Rebennack on November 21, 1940, most of us know him better as Dr. John, sometimes lovingly referred to as “The Night Tripper.” He looms large in the world of popular music for several reasons, chief among them being his knack for currycombing the musical landscape, filling his knapsack with the likes of zydeco, rock and roll, jazz, honky tonk, gospel, soul, blues, and boogie-woogie, then simmering that lot in a sonic stew that bursts upon us with a soulful, joyous bedlam. Amen! Known for his larger than life personality, he is held in high esteem among his peers for his extraordinary musicianship. His early performances are the stuff of myth and legend, and just dropping a needle on one of his many exceptional albums will ignite the passions gathered in any given space. This week, Throwback Thursday looks at his 1989 album, In a Sentimental Mood on Warner Bros. Records. 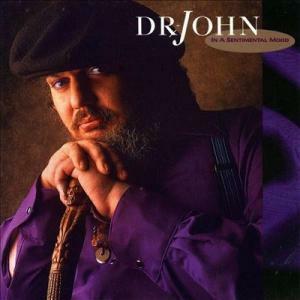 Released on May 8th, 1989, Dr. John’s twelfth album contains nine tracks with a running time of just under 41 minutes. Among the many brilliant musicians playing here are Hugh McCracken on guitar, Marcus Miller on bass, Harvey Mason on drums, and David “Fathead” Newman on sax. That friends, is only a sampling of the mighty musicianship on this album. As the title suggests, the tracks are mostly well known and loved standards, including those of the marvelous Johnny Mercer, Cole Porter, Duke Ellington, and William Rose. Sure, these songs have been done, and redone, but therein lies their beauty and resilience. It’s pretty hard to ruin a standards of this caliber, unless of course you are Sid Vicious. The album starts out with the Gus Kahn, Walter Donaldson classic “Makin’ Whoopee,” and while John’s piano and vocal adds a bit of NOLA flavor, Rickie Lee Jones provides the counter of the feminine perspective layered in velvet, draped just so over the music. This recording earned the 1989 Grammy Award for Best Jazz Vocal Performance, Duo Or Group. There’s the subtle, but steady strength of Duke Ellington’s “In a Sentimental Mood.” The slowly building energy of Jessie Mae Robinson’s “Black Night” is further imbued with a sense of urgency with the Doctor’s gritty vocals, while “Don’t Let The Sun Catch You Cryin'” is as easy and comforting as a walk along the beach. Another well worn, but always appreciated turn is Cole Porter’s “Love for Sale,” which has been covered by blues players, jazz giants, and even a rock and roller or two. Here, it has an upbeat, jazzy feel that is just the ticket. As “More Than You Know” pours from the speakers, immediately the listener is sitting in a smokey, candle-lit speakeasy, just swimming in the piano lines and vocals as they carry them along. The musicianship here is understated and superb. The mix and sound quality, the production, and the overall presentation of the music is all that one hopes for in a recording of this caliber. In a Sentimental Mood is just one example why Dr. John has earned six Grammy Awards over the course of his decades long career. If it has been a while since this music has graced your ears, become reacquainted with this beautiful and moving album by a master of the form.